I’ve known Chris Rowen for 25 years, when he returned from his 3 year visit to Japan in 1983 we became firm friends, we trained together, often at Chris’s full time Dojo at the time in the East/West Centre in the heart of London and Chris taught on many of my courses through the years. We’ve just returned from the 18th Annual Summer Course in the Jizerka Mountains of the Czech Republic (you can read the course report from Gavin King here ) and I thought this would be the perfect opportunity to ask him the more unusual questions about his opinions of his mentor, the late great Yamaguchi Gogen 10th Dan and his views on Japanese Budo, the component parts of his Goju Kai Karate, the yoga, healing arts and kobudo. Secretary of the English Karate Council, but in his heart he was a man of Budo. A Shinto priest, a healer, a kobudo expert as well as a karateka, Chris is a true follower of the ‘way’ of Budo. Throughout those 25 years, I have watched Chris grow, following the formula given to him by Yamaguchi Gogen, Chris has dedicated his life to the ‘way’, he is a quiet, dignified person and that demeanour belies the skill and deadly power that his daily training routine and religious observances have given him. SR Hi Chris, because you’re a quiet person, it makes you a bit of an ‘enigma’ to many people, can you give the readers an idea of your educational background? CR Hi Steve, I was bought up in the Roman Catholic faith and attended a Catholic boarding college run by monks studying Latin and Greek. It was quite a strict regime – we only had one afternoon off once a fortnight and we spent a lot of time in prayer and study. SR So you virtually had a monastic lifestyle? This probably helped you when you made the trip to Japan. CR That’s right, I have a sense of history, not to be bound by the past, but to learn from it to understand the present and future. In the end though, despite my upbringing, I decided that the Catholic religion wasn’t for me. I continued my education and moved into medical research. SR Did do any sports or martial arts at the College? CR Yes, I always loved sports and anything ‘physical’, at that time it was mainly boxing and athletics. SR What about martial arts? CR I’d been training in martial arts and sports in general from an early age in Manchester, ending up mainly in Ju Jitsu and Karate. SR Who did you do Ju Jitsu with? CR I trained with Roy Booth among others. By the time I had left college I had stopped doing sports and decided to focus on the MA’s to keep fit and healthy. SR What made you decide to go to Japan? CR I was studying the history and mental aspects of the martial arts and it was those studies that made me decide to go to Japan in ’77. SR When you went out there was you looking specifically for Ju Jitsu? CR No, I was just looking for any martial arts, I had some friends out there and they made the necessary introductions for me in Ju Jitsu and Shorinji Kempo. SR So how did you end up going to Karate and Yamaguchi Gogen? CR When I returned to the UK I became more interested in Karate and I started to learn about Hanshi Yamaguchi Gogen and was attracted by his sense of history, his spiritual outlook and training. SR How did you arrange the meeting? CR I wrote to him first to get the invitation and made the first trip and stayed for a few weeks, Hanshi pointed out to me that if I really wanted to learn then a much longer stay would be necessary. It was professional suicide to give up my job, home and everything in the UK to go to Japan for3 years in 1980, but I just knew I had to do it, if I didn’t, I felt that I would regret it for the rest of my life. It was a unique opportunity to train with a ‘living treasure’ in Japan and I just couldn’t turn it down. SR What was the training like? CR The dojo training was extremely hard with a very high standard, taught mostly by Hanshi’s son Goshi, who was a very talented performer and teacher. His father would often be present in classes and on courses. SR Can we talk about Goju as a style? Readers may have some confusion as to what the differences are between Goju Ryu and Goju Kai. As Goju translates as hard/soft I generally see the hard in most practitioners but not the soft, you are one person that seems to have found that balance and I presume those skills came from Yamaguchi Hanshi? CR The generic term for the style is Goju Ryu, this was created by Miyagi Chojin. Goju Kai was the name created by Yamaguchi Gogen specifically for the Japanese association and this became known as his way of training which essentially came from his personal experience. Miyagi Chojun had always encouraged his students to progress and take information from a variety of sources as he had done from the various visiting tea merchants and the Goju Ryu Research Centre that he founded and was visited by many Okinawan karate masters at the time. Yamaguchi Hanshi drew heavily on his deep yoga and Shinto experience alongside his varied martial arts training. He was a native of Kyushu which had a very strong martial arts tradition in itself, the art of Jigen Ryu is very well known in that area and Hanshi studied it from a young age - and therefore always had that ‘budo quality’ about him and his training, he was also in getting what we now know as ‘sport karate’ accepted by the Japanese government. He was well known in his younger days as being a powerful martial artist and a strong budoka in every sense of the word. He would sometimes use the term ‘Goju Ryu’ to describe what he did in fact my certificate from him entitles me to teach Goju Ryu but he would always use the words ‘budo’ and ‘budoka’ as the natural terms for his training and what he was. SR Do you think his yoga helped him to understand the internal system of training? I ask because the exercises that you use for warm up and your kata training I can identify as internal training, but I have yet to see anything in Okinawan Goju Ryu that resembles an internal system. CR Absolutely, a lot of the breathing exercises he used and preparatory training came from his yoga. He also invited a lot of other martial arts masters to the school to teach and share their knowledge, so we were given a broad perspective of budo and training to a high level. Add in the shugyo (austerity training), mountain training and meditation that was in the way of the ‘yamabushi’ (mountain warriors) you could clearly see Hanshi’s affinity to nature and the Shinto way that had been passed down through the ages. Training outside with him was always a valuable and spiritually uplifting experience. SR Did the Shinto religion play a big part of what he was? CR Yes, in fact he was a Shinto priest. I wouldn’t want to be presumptuous and say that I know too much about him but his whole demeanour would attest to that being correct. SR Can you comment on his character outside of the martial arts? CR There was something really special about him, he was very kind and courteous, but I guess that was attributable to his training, so it’s hard to say where his martial arts stopped and anything else began. He was the same inside or outside of the Dojo. SR He obviously had a profound influence on you coming from a strong catholic background and schooling, this must have been quite a culture shock! CR I’d like to make the point that there was no Shinto ‘cult’ thing going on at the Dojo, it was up to the individual if they wanted to follow that direction and they would have to actively pursue it themselves. The idea of nature worship from our outdoor training and the Shinto way really appealed to me. SR The philosopher Alan Watts said that we were born out of this world and not into it, that the big bang of the universe is still a part of all of us and that we’re interdependent with the rest of the universe and not independent of it, that’s really a Shinto philosophy isn’t it? CR Shinto sees ‘kami’ or gods, not in the Christian Judean way but in anything in nature that gives us a sense of awe or wonderment, some people are drawn to the sea, some to trees, rocks, mountains, the Shinto way to me has a shamanistic quality of this connection with nature. Also having respect for the interdependence as opposed to the independence of everything in this universe. SR Was this a sudden attraction to the Shinto way or something that grew over a period of time? CR It just sat right with me, I felt that it was somewhere I wanted to be. SR Hanshi guided you in many ways, apart from the Shinto way he also guided you into weapons training and the healing arts, can you talk about that? CR Hanshi would invite different kobudo teachers to visit the Dojo like Inoue Sensei and send students like myself to other instructors like Akamine Sensei with whom I trained in Okinawa. SR What about the healing side? 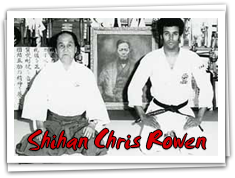 CR Hanshi gave me a letter of introduction to whoever he felt would help me to become a well-rounded person in the Martial Arts, he always encouraged students to gain a wide level of instruction, for example in the Shinto way, kobudo, and the healing arts. I often had to travel to different parts of Japan to study with them. Hanshi taught me that to protect yourself properly in the Martial arts you had to learn to become a complete person, so he structured my teaching for mind, body and soul. This way, I learned the true meaning of Goju, the proper balance of hard and soft and how to be internally connected with a proper foundation. SR In Jizerka I taught the internal Chinese system and you were able to teach directly from that, I’ve never met any other Goju practitioner that can do that. CR You’re right it is quite rare, I would consider the ‘ju’ part of Goju 50 % of the training, it seems to be lost in some other quarters. SR Have you been back to Japan much since your 3 year visit? CR I went back a couple of times, but not so much since Hanshi passed away. I still go back occasionally. SR Since you’ve been back from Japan have you had any more main influences on your training? SR That’s for sure! The yogic and Shinto training obviously made a big difference to Hanshi’s development and maybe many Goju practitioners missed the more Chinese and internal aspects of the training, but because of the sensitivity that Hanshi developed, he was able to pick up on it? CR In my opinion they helped immensely and that was a big part of his ‘ju’ (soft) development, it’s helped me to work with you over all these years. SR In his book ‘Memories Dreams and Reflections’ Carl Jung talks about the ‘common unconscious’ that every thought is a structure that exists in the human psyche for ever and that they can still be accessed. One reason that I keep pictures of my lineage in Karate and Tai Chi in my Dojo is that every time I train and perform a form that is common to them I feel that they are watching me with interest and I seek inspiration from them and their thoughts. Okay, it’s probably just a mental ‘tool’ in my toolbox for inspiration, but it works for me! When I look at the Shinto way, I see the same tools and Hanshi’s softness and inspired ways of teaching could well have come to him in a similar way? CR I think that’s very important, on a personal level I always use the etiquette, respect, and formal salutations to engender the same feelings and by asking for the support of the ancestors helps to keep us humble and in our place, not to become arrogant and egotistical. SR Also I constantly refer to the classics for inspiration, they were written by the ancestors and provide clues for us to pursue, sometimes they inspire me to study and discover and sometimes I discover on my own and can validate my discoveries in the classics. CR It’s all there to be passed down to us. We’re not just training to fight – that leads us down a very narrow road, after all the Budo Arts are not just about fighting. To become a complete person, we need to take the widest perspective. Musashi Miyamoto said ‘learn from all people and ‘learn from all skills’ - we wear a keikogi not a ‘gi’ – keiko means to study something deeply. I believe that as martial artists we have the important responsibility of ‘satsu/katsu’ - the ability to give or take life, we have the responsibility to deal with this skill properly by introspection, control and a proper philosophy. SR If you had to encapsulate your Goju how would you do it? CR A balance between hard and soft – to release your full potential, to be honest, to be functional and encourage self growth. It’s important to improve not only physically but in all aspects. SR The thing I love about martial arts is that they are validated physically, after all the talk – you can either do it or you cant! CR Exactly – that’s why we’ve been friends for so many years! SR Where do you see your progression going from here? CR I’m please with the development we’ve had at Jizerka, Tai Chi, Aikido and Karate, all the students and instructors working and growing together through the arts. I would like to define the traditional way – and particularly for Goju for anyone who is interested. I am finding that people seek out traditional budo instructors because what we are teaching is different. SR You’re hard to find! I think you should be more accessible! CR You’re probably right there Steve, but I intend to remedy that. My group, the Bunbukan, now also has branches in the USA and Africa with people looking for that something more… I like to think that I lift up the corner of the rug and let them explore the Budo ‘way’ from there. SR Anything that you’d like to add there Chris? CR Only that with greater knowledge comes greater responsibility, I’d like to thank everyone who has taught and trained with me over the years for their tuition and friendship – and most of all to my mentor, the late Hanshi Yamaguchi Gogen. they appreciate his depth of knowledge in the Japanese language, culture and spiritual way. the Martial Arts could give you.